UAVs or drones can also be equipped with transmitters that share the footage in real time, allowing the operator to see exactly what is going on at a given time. Drones are able to fly within a couple of metres of the power lines, thus providing high quality footage in the safest possible way. Aerial drone surveys are a new alternative for inspections whether it’s an on or off-shore wind farm inspection, solar panel survey, hydroelectric plant our aerial inspections are guaranteed to save time, money and human resources. It is the new way of collecting data for wind turbine blades. 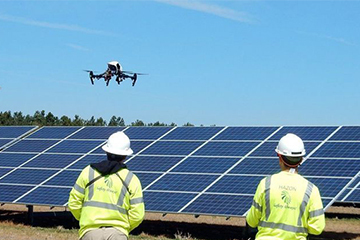 Solar- Drones are capable of providing solar firms with unparalleled benefit stacking opportunities and are significantly safer, faster and less expensive than the traditional solutions that drones are slated to replace in the near future. There are workable solutions available for residential solar, commercial solar, solar farms and for firms that provide consultation to the solar industry. Wind- In the wind energy sector, the requirement to keep wind turbines running at 100% maximum efficiency is of vital importance. With the use of commercial grade aerial drones, wind turbine inspection can now be done in a fraction of the time and with significant cost savings. We are able to provide a comprehensive inspection and survey service for businesses in the wind energy sector. Our advanced aerial drones can inspect multiple turbines in one flight and can cover an entire wind farm plot in one day.